Karen Lawler, of Clare, carries a bag of pulled weeds and garbage Thursday morning while helping out during the Downtown Fall Clean-u Day. 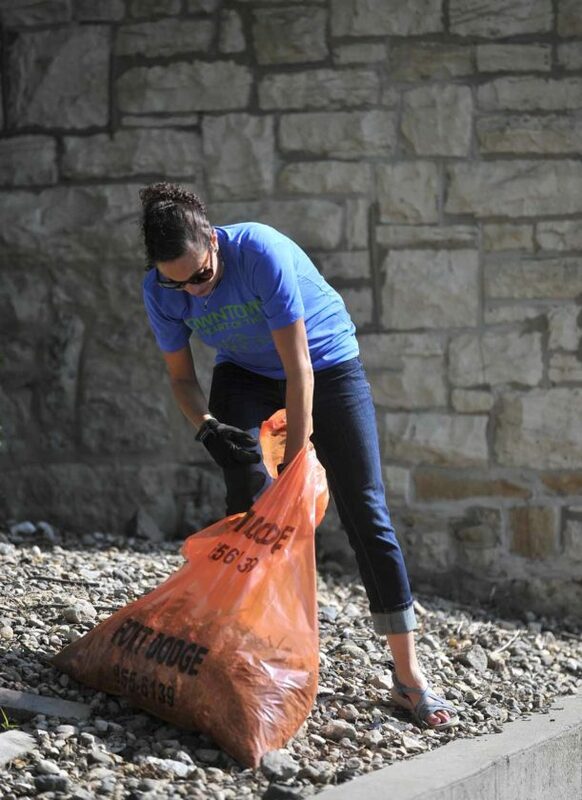 Not everything that was found Thursday as a group of volunteers picked up litter, cleared debris and pulled weeds in downtown Fort Dodge during the Main Street Fort Dodge Fall Cleanup Day was junk. Mary Kay Daniel, of Fort Dodge, and several of her group of volunteers found something rather nice. Of course, in the spirit of the kindness rocks – hand painted rocks with friendly messages on them – she didn’t keep them. Mary Kay Daniel, of Fort Dodge, helps pick up debris and weeds Thursday morning during a Downtown Fall Clean-up Day. 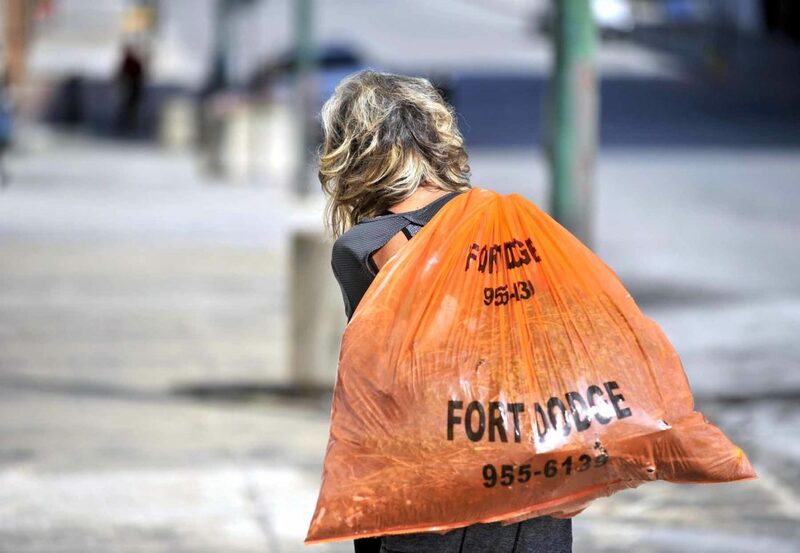 Thursday’s cleanup event focused on downtown Fort Dodge. As owner of Mary Kay’s Gifts and Home Decor, Daniel was happy to help out and see the improvement in appearance in the business district. 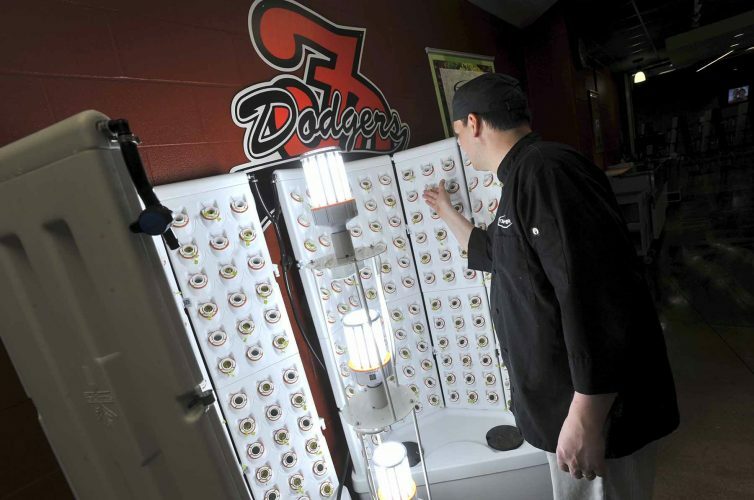 “You want the outside to look as nice as the inside of your business,” she said. She was surprised at just how much litter there was. “We’ve only gone a couple of blocks and we’ve already filled three bags,” she said. Karen Lawler, of Clare, was among the volunteers. She’s a secretary in the city of Fort Dodge Engineering, Business Affairs and Community Growth Department. 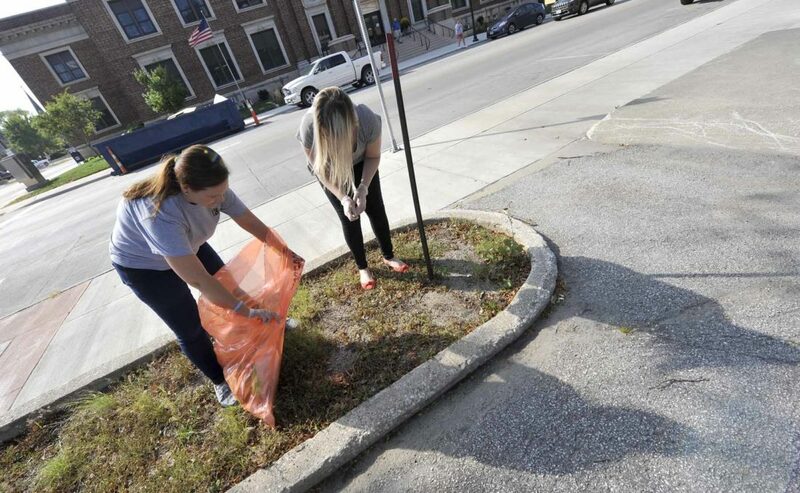 Shelby Wright, at left, along with Kyla Lentsch, both of Fort Dodge, pick up litter and debris in the 800 block of First Avenue South Thursday morning during a Downtown Fall Clean-up Day. She was surprised at the amount of weeds growing in various places such as sidewalk cracks and along curbs. She picked up plenty of standard debris as well. She did opt to leave a couple of items where they were. Carissa Harvey, city of Fort Dodge senior planner, helped organize the event. 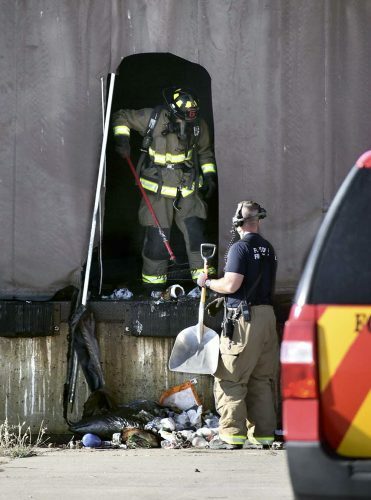 Four of those put on their gloves and hit the streets, alleys and sidewalks with bright orange bags. The fifth group got to work in the 800 block of Central Avenue putting flowers into a set of new planters that have replaced a set of trees that were no longer viable in that environment. When they finished, the planters were full of a variety of colorful blooming flowers. Another crew got in on the cleanup earlier in the day, Harvey said. “The crew from Public Works came through with the street sweeper this morning,” she said. Shelby Wright and Kyla Lentsch, both of Fort Dodge, work at Kingsgate Insurance. In addition, Lentsch lives downtown. The area they were working in contained the usual litter, but not as much as they thought would be there. “I thought we would find more,” she said. Of course, finding an area relatively clean during a cleanup, that may not be such a bad thing.